All of our products go through numerous analyses and tests before we finalize their shapes, materials, and designs, so you can enjoy the water like never before! Thurso Surf inflatable SUPs are built with DOUBLE LAYER construction using TRIPLE/QUAD Military Grade PVC coatings. This structure provides the ultimate toughness, rigidity and durability, and makes our boards the STRONGEST inflatable paddle boards on the market. Carbon shaft paddles are included as standard in ALL Thurso Surf SUP packages, unlike other brands because carbon fiber is a game changer. Its lightweight and rigid characteristics make it the best material for high performance paddles. This means you can paddle faster and further with less fatigue and more FUN! If you’re looking for fantastic products and great values, you’ve come to the right place. 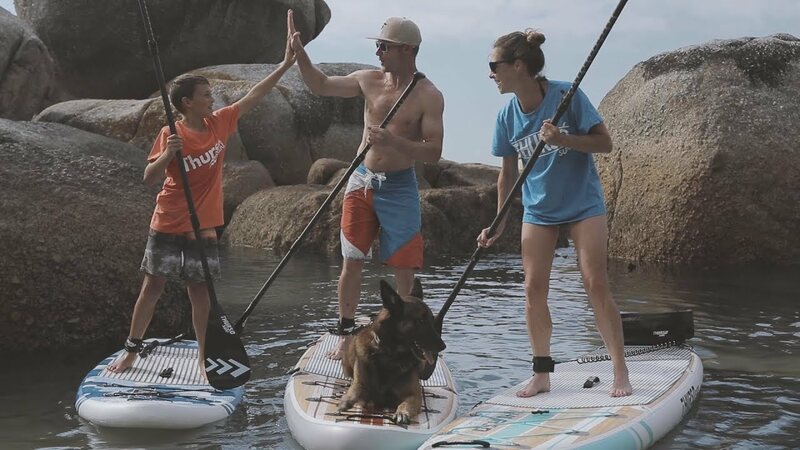 Watch the featured video of our Brand New 2019 SUP lineup. We headed to Cape Town to capture all the awesome upgrades on the water. Scope out the new graphics, rigging, upgrades, and ultra-comfy wheelie bags ready to help you Explore the Beyond. It’s time to get stoked, the 2019 stand-up paddle boards are here! Thurso Surf paddle boards have quickly become the best seller among all the competitors. Read why Thurso Surf SUP is highly rated by the industry experts. Paddleboard vs. Kayak — Which Should You Buy?